I have a review of South African photographer David Goldblatt’s exhibition, Intersections Intersected, up on the Web site Change Observer. I highly recommend that people in the area view this two-floor show at New York’s New Museum from his nearly fifty years of work. It is highly political, thoughtful, intensely passionate, extraordinarily nuanced, and uses digital printing in some very interesting ways. This was written by fredritchin. Posted on Friday, September 4, 2009, at 4:29 pm. Filed under The World. 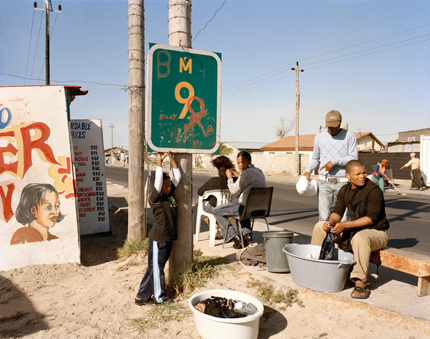 Tagged David Goldblatt, South Africa. Bookmark the permalink. Follow comments here with the RSS feed. Post a comment or leave a trackback. I just read David Goldblatt: Fifty-One Years, which had that same interview in it. Fascinating stuff… it also had writing by Nadine Gordimer, who Goldblatt collaborated with quite a lot, and other South African writers. Fantastic exhibit. Went to it in August and was so blown away. Not South African myself but living here, it is always difficult to figure out which kind of representation we want to convey about this country. It is as exploded socially as it is in its identity, and geographically. I saw David Goldblatt show in NY, and I know his work for a while… It is purely the most consistent work about the country. On the top of that there was an exhibition about the Black Panther at the same time… Very clever to put the two together. Thank you for notifying, I hope lot of people will go and see it.